It took me longer to read this book than it should have. Not because it was a bad book. But because when I took the book home, my 8-year-old nephew took the book and wouldn’t give it back until he had finished reading it. Then and only then would he allow me to read it. 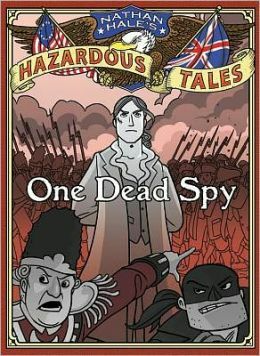 In Nathan Hale’s Hazardous Tales Nathan Hale (the spy from the Revolutionary War that was hung, not the Nathan Hale that is the author/illustrator) tells about the beginnings of the Revolutionary War. Specifically such details as how he became a spy and how he was caught. However, with such a grusome ending in store for Mr. Hale, I did not expect the story to be quite as comical and hilarious as it was. But with Nathan Hale (the author, not the spy) writing everything, it is no wonder that I laughed-out-loud multiple times. I love that so much history of the United States is in this fun-packed graphic novel. I like that there are loads of details (and that the notes of said details are just as funny as the actual novel). This is one of those books that will beg elementary-school-aged boys to read it over and over and over again. Well, that is after they have read the rest in the series. I think our library needs to make a boys’ program based off of this book. It is a gem! Why do you think the author decided to have Nathan Hale tell this particular story? Which people in American history did you enjoy reading about? Why? What did the eagle and the book have to do with anything? Whose side do you think the hangman is on? Why? What did you learn about American history from this book? What do you think will happen in the next book? April 12, 2013 in adventure, book discussion questions, elementary school, graphic novel, juvenile, middle school, nonfiction.